Acer palmatum Bloodgood – A Purple Leafed Japanese Maple. One of the best purple leafed Japanese Maples, Acer palmatum Bloodgood is a small tree with a good growth rate. It has been grown in Australia for many years, proving its worthiness in many garrdens. Over time will form a broad spreading crown and make a good feature tree. The foliage is a deep plum purple, leaves are serrated and autumn colour is a strong crimson. This is taller growing than many of the cultivars and will reach 5 metres in height, still a small tree, and suited to smaller gardens. Acer palmatum Bloodgood is excellent when used as a small deciduous shade tree. Suited to planting in parks, gardens and as a background tree in the garden border. Also useful for planting next to driveways in broader landscaping applications. Spread – Will form a crown of 5 metres in an open position. Growth Rate – Medium to fast for a Maple tree when young, slowing as it ages. Position – Best in a position protected from the hottest sun in warmer areas, also best if protected from cold winds. Soil – Humus rich, well drained and fertile. Foliage – Deep purple, turing crimson in autumn. 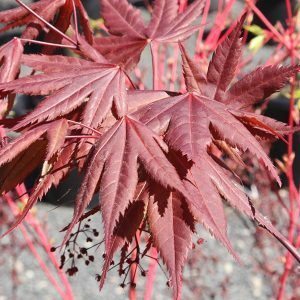 Acer palmatum ‘Bloodgood’ is available for sale from the following nurseries.